The rise of President Jair Bolsonaro of Brazil has put the environment and human rights in peril. His promises to open the Amazon for business could result in huge deforestation and the release of vast greenhouse gas emissions. His threats to slash fundamental environmental and indigenous rights standards that help keep the Amazon standing are a threat to climate stability. Bolsonaro, however, wouldn’t be the only one to blame for devastating the Amazon. Companies that accept his invitation to reap profit from Amazon destruction, and the financial institutions that provide the capital, will also bear great responsibility. And those poised to benefit from Bolsonaro’s reckless policies include American companies and financial institutions. Two of the largest publicly traded agribusiness firms operating in the Brazilian Amazon — Archer Daniels Midland and Bunge — are American-based companies. Agribusiness, in particular soy and beef production, is a leading driver of forest loss and human-rights abuses in the Brazilian Amazon, and ADM and Bunge are two of the largest soy traders in Brazil. As producers seek more and more land for growing crops and grazing cattle, they push ever deeper into the Amazon. According to a report published in 2014, an estimated 90 per cent of deforestation in the Brazilian Amazon is due to agribusiness activities. 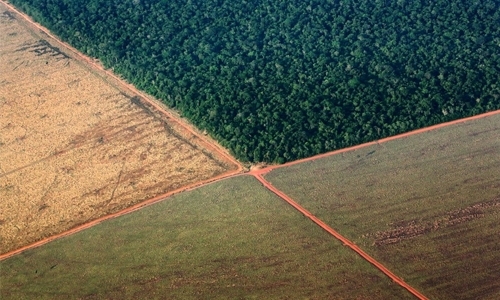 Where would these powerful agribusiness companies get the capital they need to bulldoze deeper into the Amazon, if they should take Bolsonaro up on his offer to eliminate environmental protections? In no small part from American-based asset managers BlackRock, State Street and Vanguard, which are shareholders in all five of the largest publicly traded agribusiness companies operating in the Brazilian Amazon. As a group of researchers recently demonstrated, the “Big Three” asset managers hold 15pc to 20pc of all of ADM and Bunge’s available shares (finance researchers call ownership above 5pc of all shares “blockholding” and generally assume it to imply significant influence). This means they have the potential to exert pressure on the very companies that could either moderate or enable Bolsonaro’s threats to the future of the Amazon — and the climate. Many Americans, in turn, have a direct relationship with those asset managers, since those firms manage many pension funds and retirement accounts. Of course, Bolsonaro’s agribusiness-friendly agenda should not be seen in isolation. Previous Brazilian administrations also worked to undermine environmental and human rights protections to benefit the industrial exploitation of the Amazon. It required the concerted efforts of Brazilian indigenous and social groups and their global allies to force governments and corporations operating in the Amazon to curb deforestation, which until recently had been relatively contained. Yet Fink’s most recent letter to investors, published this month, makes no direct mention of climate change, and BlackRock’s statement after Brazil’s election in October appears to celebrate Bolsonaro’s win, lauding his commitment “to building on the reform agenda put in place over the past two years.” Though the role of asset managers might seem far removed from the felling of trees in the Amazon rain forest, the world’s largest asset managers could play a pivotal role in safeguarding the global climate by way of their investments in companies operating in biomes crucial to climate stability like the Amazon rain forest. The world could have less than 12 years to turn this sinking climate ship around, as the Intergovernmental Panel on Climate Change’s most recent report makes clear. Bolsonaro’s rise to power will test companies’ promises to be responsible. Will leading global agribusiness companies be complicit in Bolsonaro’s assault on the Amazon and its people, thus sacrificing their commitments, their reputation and our climate? And will financial institutions like BlackRock heed their own calls for companies to pursue purpose and not just profit? Or will they put short-term profits ahead of the planet’s future? If these influential companies don’t take a clear and principled stand against Mr Bolsonaro’s promises to open the Amazon for business, they will also bear responsibility for abetting his plunder of the world’s largest tropical rain forest.